Paritos Kar was born in the small town of Cooch Behar in West Bengal. A friend introduced him to Aikido, while he was in Japan studying at the Language Institute of Tokyo. 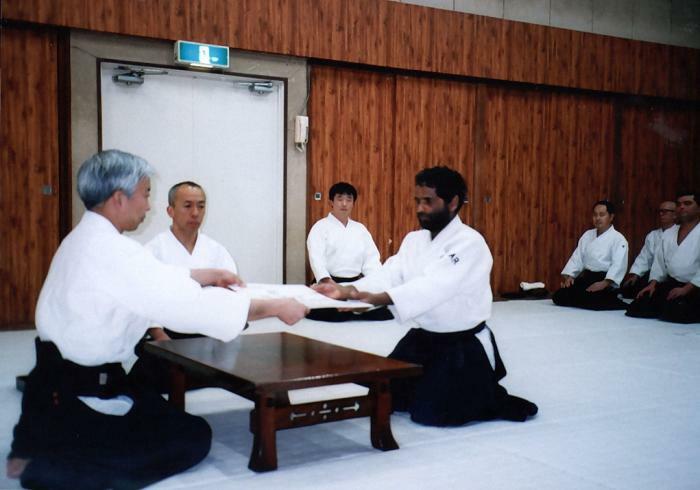 In 1987, after studying Japanese for two years, he started his Aikido training. Sensei Kar has over fifteen years of training in Aikido, including five years in a special Aikido Academy. Paritos has trained under many of the senior ranking teachers at the Aikikai Hombu Dojo. He is indebted to teachers like the late Doshu, Kisshomaru Ueshiba; his son, Moriteru Ueshiba Doshu; Okumura Sensei and Yamaguchi Sensei. He is also grateful to the Aikido academy and the teachers at the time: Seki Sensei, Osawa Sensei, Kobayashi Sensei and Kanazawa Sensei. In 1994 he went to far eastern Russia to teach Aikido and received tremendous positive responses from his students. But faced with the choice to either stay in Russia or to return to his birth country, Sensei Kar made the decision to return to India. Now living in New Delhi with his own dojo, Paritos wishes to popularize Aikido, still relatively unknown in this country, in order to help spread O-Sensei’s message of peace. Besides holding a 5th Dan blackbelt, Sensei Kar, who is fluent in six languages, also teaches Japanese.